Several years ago I was browsing through a bookstore and came across something really special. At first I didn’t really know what I was looking at. It was a collection of photographs and doodles and maps and all sorts of ephemera randomly crammed into the book. I was hooked and bought the book. It was later, when the excitement cooled a bit and I took the time to actually read the introduction and the back of the book that I found what I was looking at was actually a collection of the journals of a remarkable guy. Dan Eldon was born in London in 1970 but soon moved with his family to Nairobi, Kenya. He started taking photos for a local newspaper at a very young age, and developed a wonderful sense of adventure. He also, early on, began to collect both his photographs and his adventures in a series of notebooks. These notebooks are not the standard diary entries and list of sites you might expect. They are a collection of layer upon layer of photos, paintings, ticket stubs, doodles, cut outs, hand outs, smears, feathers, coins, invitations and all sorts of important bits and pieces from his life and travels. Dan took his notebooks with him everywhere along with a bin full of art supplies so that he could use any downtime (when did he have downtime?) at all to update and re-work page after page of his notebooks. Looking through his books you feel like an archeologist. You dig down through strata of entries and ephemera that seem to be in no chronological order at all. You can piece together his experiences by finding clues throughout the books. I really can’t do them justice in this post. Fortunately you can get a look at them online. A project at rest tends to remain at rest and a project in motion tends to remain in motion. The same thing holds true with starting a journal. There is a never-ending supply of beautiful blank books available today. I was given a fantastic journal for my birthday one year. I remember it looked like a blank bible. I think the edges were even guilt. I never once wrote in it. It was just too nice. I didn’t always keep a journal, but I always wanted to. That’s why I collected the great books. But lets face it. I am no Leonardo Da Vinci or Indiana Jones. What did I have to write about? Then, one day I was leaving on a trip to Dallas and I saw the shelf of blank books. On impulse I grabbed a small one that would fit in my back pocket and headed to the airport. I was determined to start a journal that very day. Unfortunately (or was it?) It turned out that the book I grabbed was not a blank book at all. It was, in fact, a small week-at-a-glance calendar. When I discovered this I felt like I had sabotaged myself somehow. Then it dawned on me that this was perfect! Follow my thinking here. What I had was a small, pocket-sized book that is already dated and had a very limited amount of space for entries. Instead of writing down what needed to happen on certain dates, I would make notes about what had happened. The dates would add the motivation to not skip days and the small space in which to write would relieve the pressure of having to make epic entries! That’s all it took. I made a promise to make an entry EVERY DAY, no matter how lame. I had started! From then on the journaling thing took off. I was soon making entries that were cramped into the space allowed in the calendar, but I was determined to fill the tiny book. On New Years Day I graduated from the calendar to one of wonderful blank books on the shelf! So that’s how you do it. 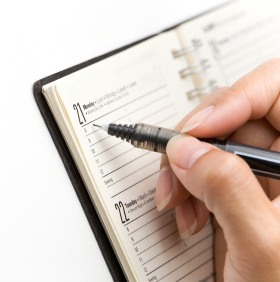 Don’t worry about making great journal entries just make entries. I promise you the entire process will take on a life of its own in no time. Don’t bog yourself down with wonderful books and pens. You can always move on to them later. Start simple. A weekly calendar. A decorated composition book. A steno pad. Just get started! Make it a habit, a part of your day. Once you get a dialogue going with your journal you will wonder how you ever lived without it. Welcome to Practical Journal Keeping! Hey, I’m Rich and I’ve been fascinated by the journaling process for years. I am interested in journals, sketchbooks, notebooks, day-books and logs of all sorts. I keep them, make them, read them and collect them and now I am going to use this blog to both, share things with like minded people, and as a place to collect my own ideas and findings.If you keep a journal, want to start a journal, bind books, read journals or in anyway think a journal could add to your life, I think this is the place for you. I’ve been keeping a journal and a sketchbook for years but this is my first attempt at blogging (journaling in the 21st century?) I love writing and sketching in a book with a pen but I am all about learning new techniques. I hope to share these techniques as I learn more about them. I will also be sharing some of my favorite journals from the famous and not so famous, some great get started techniques and many practical uses for your journals. I will explore binding and publishing your own books for and from your journals. 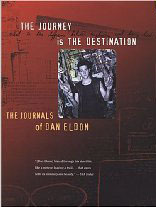 I will review sites and software for journaling electronically as well as link you to other blogs on the same subject. Whatever format you choose, journaling adds a dimension of meaning and a practical source of information gathering to your life that can both improve day-to-day functionality and focus in your life. I said earlier that this is my first attempt at a blog so I am gonna start at a pace I think I can maintain. The plan is to update weekly, I’m thinking on Mondays, with useful and entertaining content and then to keep the comments running for the rest of the week. I am hoping later, as my journaling energy kicks in, I will find I can post more often. So thanks for stopping by, and be sure to leave some comments, questions, suggestions, ideas–I have a feeling that I will get a good deal of inspiration from your comments. And just so you get a little more from this post than a “Hello World”, here is a brief list of links that you might find interesting. Not all are journaling sites per se, but they are all sites that deal with journaling and other productivity issues.